This is a listing for a reprint of a vintage Paris poster calendar page March 2011 from the Cavallini Archives. 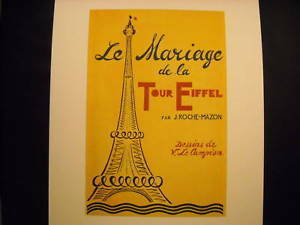 It says "Le Mariage de la Tour Eiffel par J Roche-Mazon Dessins de V. Le Campion" whimsical drawing of Eiffel tower with woman's head on top. Its striking design is printed on nice matte, textured paper. The measurements for this item is 19 inches by 13 1/2 inches.